Tonkatsu is a recent Japanese food that was “stolen” from Western cuisine. It was introduced to Japan in the 1890s and was finalized as what it is today, around the 1930s. Tonkatsu was originally a pork cutlet, a breaded and deep fried pork steak. Today, it has changed in many ways that can genuinely make it a true Japanese dish. If you are out and about in Tokyo, it’s actually quite easy to find a decent tonkatsu restaurant. They aren’t very intimidating to enter and they can be found in almost every department store and shopping mall. However, the question is of variety. Tonkatsu, or any “katsu” can come in various shapes and forms. It can be difficult to tell one from the other, aside from a large piece of meat that had been breaded and deep fried. The “traditional” way to eat tonkatsu is to go to a tonkatsu restaurant. When entering, you will get a variety of options. There are two basic cuts of meat to choose from. The first is the “hire” (hee-re), which is a fillet cut. It is sometimes spelt “fire” (fee-re) to reference the type of cut. This tends to be the more expensive option, but not necessarily the better option. I prefer the rosu (row-su), sirloin cut, which is cheaper and generally more delicious. In reality, you can’t go wrong with either cut. They ultimately taste similar, but it’s the texture that changes between the two. The next thing to think about is the type of pig. There are several varieties of pig to choose from, but the majority of restaurants will not give you a choice, the choice lays in which restaurant you enter. In the major chains, you will probably be given a standard type of pork. Some smaller shops will offer black pigs, or rather, the Berkshire Pig. It contains more fat within the meat which allows the meat to be juicier due to the long cooking process. It can take 20 minutes to cook one piece of tonkatsu. While I do recommend the basic tonkatsu for a first try, or only try, there are several variations on the basic tonkatsu. 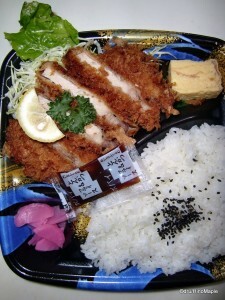 Several varieties add cheese, shiso, or other fillings into the centre of the tonkatsu. Personally, I find this degrading to the actual dish and I tend to order it as part of a set, rather than a full piece on its own. Tonkatsu is always served with tonkatsu sauce. It will always be at the table, ready for consumption. There can be anywhere from one to three types of sauce. Generally, there is the “regular” sauce, the spicier one, and sometimes a sweeter one. Usually, I can’t tell the difference between them, but they are delicious. You can put as little, or as much as you’d like on top of the tonkatsu. A couple of restaurants will offer ground up sesame seeds to be added with the sauce. Sometimes you can grind them up yourself, other times you just add it to a dish and mix with the sauce. This is a great variation of the traditional sauce, and since I’m a big nut for sesame, I love it when they give me this option. 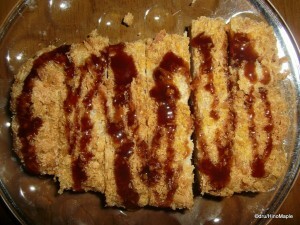 Do beware that, if you put too much sauce on the tonkatsu, it will obviously become too soggy and change the texture. Do note that there is also a small dish of Japanese mustard. Beware that this is very spicy, similar to wasabi. You can also put as much, or as little of the mustard, on the tonkatsu as well. After choosing which tonkatsu to get, you also get to see the basic side dishes that come with it. Going to a tonkatsu restaurant will mean you get a set meal. 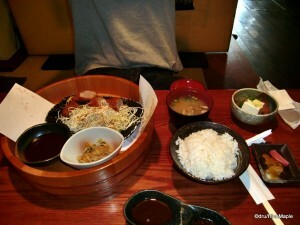 You will usually get a large tonkatsu, cabbage, rice, miso soup, and tsukemono (Japanese pickles). The cabbage is sliced thinner than coleslaw and it comes with no dressing. Generally, the dressing is on the side, or at the table. The most common way to eat it is to squeeze out a bunch of Japanese mayonnaise; or add a western style salad dressing; or add the tonkatsu sauce. Adding either of these three sauces are fine, but they do come with various side effects, such as a larger waistline. If you do go to a large chain, you should be aware that the rice and miso soup are usually free. If you want more, you just have to ask your server. It’s pretty simple to do so, but it might be difficult at times if the restaurant is busy. 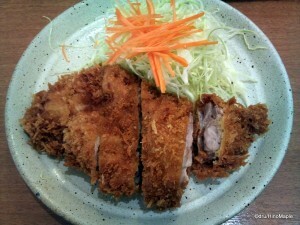 If you are thinking that a big piece of pork is not a good meal, tonkatsu shops tend to offer a variety of foods. Many shops will offer some deep fried vegetables, chicken or beef instead of pork, or seafood such as shrimp. Often, they have mix and match plates that include a taste of the major foods, but I generally prefer the basic roast cuts. Tonkatsu itself can be a little expensive. Generally, it starts from around 800 Yen per meal. 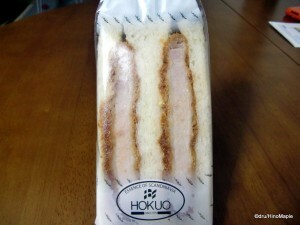 You can easily get a katsu sandwich, which is a tonkatsu stuffed between two slices of bread. There is also the katsu curry. 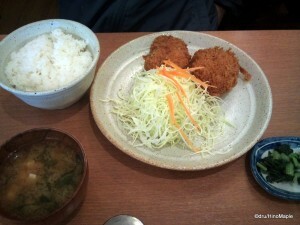 This is often served in curry houses, but the quality of the tonkatsu is usually not very good. It tends to be a little thinner than a traditional tonkatsu restaurant and it does get soggy. Often, they put the tonkatsu next to the sauce, instead of covering it with sauce, as a happy medium. For those on a budget, katsudon is a donburi style of tonkatsu with a slightly cooked scrambled egg on top. This is a good quick and cheap dish that is often served in bento shops. If you are ever in Nagoya, they serve a misokatsu, which is tonkatsu with a miso based sauce on top. I would liken it to the Chinese hoisin sauce, if you have ever tried that. If you aren’t visiting Nagoya, you will be hard pressed to find it. There are several other variations of tonkatsu, such as ramen with tonkatsu, but they tend to be less popular than the previous ones. The biggest question is where to go. Tonkatsu is everywhere and every city has at least one tonkatsu shop. The department stores are the safest option, along with the shopping malls. For the average tourist, these are the best places to go as you can get a variety of tastes on the same plate, for a reasonable price. For those who live in Japan, it’s a good idea to try out a few of the smaller shops. While I don’t like the small hole in the wall shops, some of the smaller café sized shops do have excellent food. If you see a shop with a lot of wood, and seats for about 10 or less people, this might be a good place to stop for a meal. You could be lucky enough to enjoy watching the chef prepare and cook the tonkatsu in front of you. It’s a fun experience to watch, especially if it’s an old man, as you can see him take care of the pork. The breading process and frying processes are simple, but the care and the technique are amazing. It can feel like you are watching an artist. The chef must tend to the cut of pork for most of the time as each side should be browned at roughly the same colour. If you head to a larger chain, the process is done behind a wall, and I’m sure they have automated the system somewhat by now. If you can’t find a nice small shop to enjoy it, don’t worry too much. Generally, the tastes are the same, at least for me. This entry was posted in Food and tagged bento, cabbage, coleslaw, fire, firekatsu, hire, hirekatsu, Japanese mustard, katsu curry, katsu sandwich, kurobuta, miso soup, misokatsu, pork cutlet, rosekastu, rosu, Tonkatsu, tsukemono by Dru. Bookmark the permalink.